Why Are People with Hearing Loss Not Using Hearing Instruments? The primary clinical intervention for individuals facing hearing loss is the use of hearing aids, but recent studies show that the majority of those who may benefit from hearing instruments do not use them. According to the National Health and Nutritional Examination Surveys (NHANES), only one in seven individuals aged over 50 years with hearing loss actually use a hearing device. That equates to only 14% of the of the 26 million people facing hearing loss actually taking advantage of devices that may improve their hearing. Equally surprising, the average age of first-time hearing aid users is 74 years old, often suffering from significant hearing loss for up to 10 years prior to receiving the hearing aid. So, exactly why aren’t people using hearing aids to help improve their hearing? Lack of Hearing Aid Usage: Comfort, Price, Effectiveness, what is it? There are a number of reasons to why individuals don’t use hearing aids when it may be beneficial to them. Dr. Linda S. Remensnyder, an audiologist from Illinois, says that the number one reason is that people believe that their hearing is just fine. People with hearing difficulties may believe this because hearing loss may happen gradually, where they are unable to recognize the signs of hearing loss. Those who face hearing loss can hear well in quiet surroundings, but face difficulties hearing in noisy situations, leading them to believe the problem lies within the sounds emanating from their surroundings. Stigma often prevents us from addressing issues that may impact us. The fear of looking old or judgements from others often prevent people with hearing loss from using a hearing instrument. With newer, modern hearing devices that are more discreet, the stigma people fear may lessen in addition to helping individuals function better in various environments. Another deterrence that prevents people from using hearing instruments is the price tag. The cost of hearing aids as well as their maintenance can be very high, reaching up to $7,000 per ear. People who are retired and are on a fixed income feel that they are unable to afford them. Shifting the mindset from affordability towards viewing hearing devices as an investment that improves the overall quality of life allows one to see that they’re well worth the price tag. May it be hearing stories from friends who have issues using hearing devices to feeling that they are too complicated to use to them being a barrier to everyday comfort, preconceived notions or extremely high expectations on hearing devices should not make people feel disenfranchised to the point of them stopping to use such devices. Everyone has different experiences when it comes to hearing loss, and with the remarkable modernization of hearing devices, comfort and usage has improved drastically. 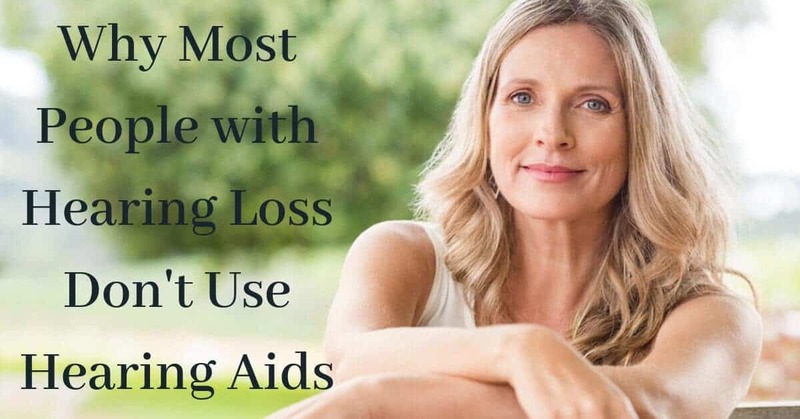 Whatever the reason for not using a hearing aid may be, it is important to recognize that hearing devices are an investment that greatly improves your quality of life. The prolonged non-usage of hearing aids often leads to other health problems. The most obvious one is the fact that those who face hearing loss are missing out on real human connections. This could lead to social isolation. According to Dr. Frank Lin, assistant professor of otolaryngology and epidemiology at Johns Hopkins University, mild hearing loss can triple the risk of falling. Furthermore, there has been studies that have suggested hearing loss being linked to dementia. Mild hearing loss can lead to doubling dementia risk, while moderate hearing loss may triple it. It’s crucial to understand that hearing aids aren’t designed to completely fix lost function. They do however maximize your ability to hear who’s talking to you. In order to be fully engaged in life, you have to be fully engaged everywhere. If you often find yourself requiring a caregiver — a spouse that feeds back information to you in conversations due to hard of hearing — you may need to take the necessary steps to addressing hearing loss. If you or a loved one is experiencing hearing loss, schedule an appointment today with one of our hearing professionals at Hearing Group for a hearing test. You can be on your way to improve quality of life issues, specifically improving communication in relationships; intimacy and warmth in family relationships, and emotional and physical stability!